For those without comedic tastes, the self-proclaimed experts at Wikipedia have an article about Windows 7. New performance. New appearence. New everything. 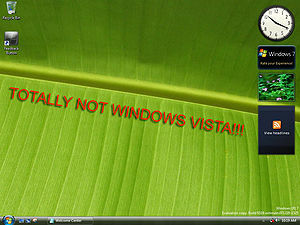 Windows 7 boasts a wide array of inbuilt applications, notably thousands of viruses. The following excerpt is taken from a pre-production box: "Now with preinstalled worms right out of the box, Windows 7 allows you to truly get on with your life, meaning that you no longer have to update your system's security, including keyloggers that keep your identity secure (read the terms and conditions) so that you don't have to!" Mr Billy Rubin, the inventor of Windows, reportedly made this move after he was sued by the creators of the infamous W32 Blaster. He stated in a recent interview, "It's for the best, really, because it means you will be disconnected from dial-up connections every 15 minutes, which will save pay-as-you-go customers a lot of money. It's ingenious technology!" Since Microsoft was sued by data recovery companies for being too stable - and thus threatening competition - Windows 7 will mean that it is effortless for users to maintain their hard drives. Specifically, any data saved will eventually spontaneously disappear. Some critics have posed the argument that this is "barely a revolutionary idea, as it already happens in Vista Infinity% of the time". Our operating system is the best because it's the standard because the standard is always the best!! Apple also sued Microsoft because "Redmond started his photocopiers". Therefore, they now have a market share in Microsoft and have decided to emblazon it with Apple logos in eye-catching locations, as they do in the iTunes visualiser. Microsoft says the interface is "nerd-friendly" thanks to the large taskbar and obvious start button. Note 'bhen chhod bhaynchod' is the Indian translation of 'start'; this is one of the languages featured in the Microsoft DPE or Destitute Persons' Edition, which has been labelled a "boom-take". The default DPE wallpaper is a beautiful panoramic shot of the modern Indian landscape, also shown in the screenshot. Windows 7 still has Aero and it looks almost the same high quality glass themes like in Vista. Billy Rubin promises that the new preinstalled games will be close to reality, a notable example being "Microsoft Virtual Kitten Huffing Simulator X 2009(C)"
This page was last edited on 17 April 2017, at 10:11.